If you have seen or tried Blasted Church wines, you will likely not forget them. Why? Part of it is because of their gorgeous wines, but the other is because of their wonderful wine labels. 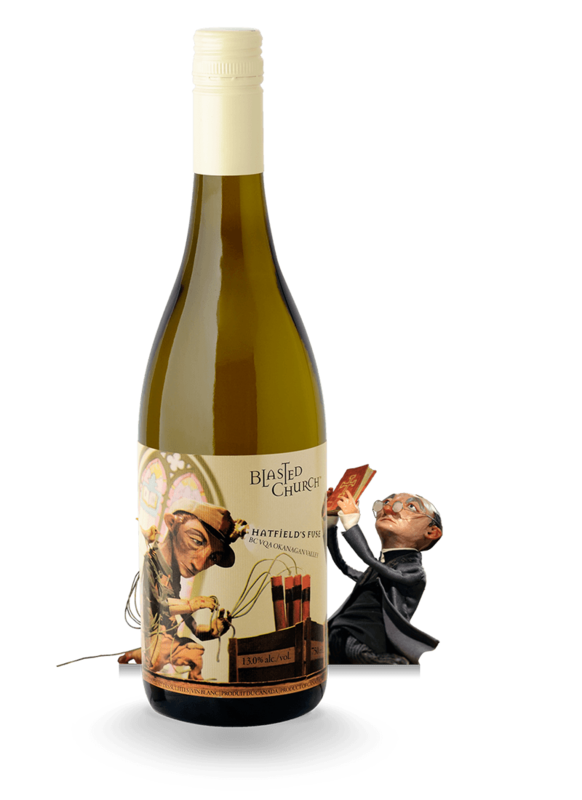 A step away from the stuffy, traditional labels, Blasted Church features fun cartoons and even cute wine names (example: Hatfield’s Fuse, Mixed Blessing, Big Bang Theory, Bible Thumper). Blasted Church sits atop a windy, road in beautiful Okanagan Falls. You can look over the entire valley from their vineyard. Their tasting room is cute and even has an adorable chocolate lab that will follow you everywhere. It tried to climb into our car (we had beef jerky in it). I alllmoost took her home. Almost. Blasted Church is a fun winery to visit if you are in the area, the vineyard even has a pool, though I didn’t get in it myself nor do I know what the rules are about taking a dip. The dog however, gets free access whenever she wants! While we were at Blasted Church, we tasted quite a few wines, and their whites were a stand out. Their reds weren’t bad but I prefer my reds to hit me in the face bold, and what we tasted was just not quite there yet. Very close but just something missed the mark for me. Perhaps a bit young? It is probably perfect for someone with a different pallet than me. I am not a wine expert and I certainly didn’t try every single red Blasted Church had to offer or every vintage, so I am just going by my gut feeling based on an assessment of what we tried. I am sure you guys will write in and yell at me for having bad taste and I am sure at some future party someone will bring some amazing bottle of red from Blasted Church and I will be proven wrong. Anyways, back to the whites! As I said their whites were quite spectaicular. I especially had a soft spot for their 2013 Gewürztraminer, the 2011 OMG Sparkling and the 2012 Bible Thumper (Pinot Gris/Chardonnay mix). 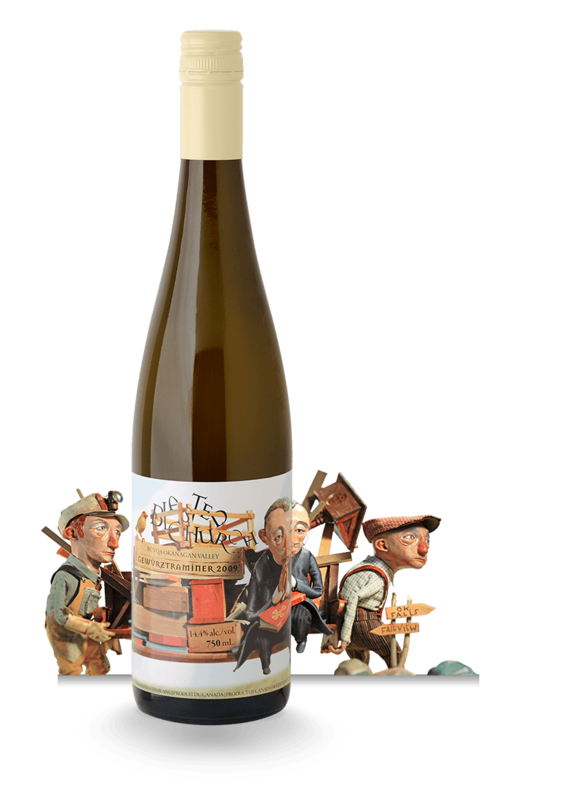 The 2013 Gewürztraminer is refreshing with a long finish. That finish really is quite amazing. You’ll taste the lychee and tropical notes on first sip and a citrusy finish that kicks in afterwards. Pretty neat. I quite enjoyed it and we picked up a bottle for our little collection. Their 2012 Bible Thumper is also a fantastic white. It has a great mix of peach with some citrus. It’s very full bodied and you’ll also taste some caramel/vanilla in there. The Bible Thumper is one of their whites that is aged in oak barrels, you can really taste the fuller flavour in there compared to the Gewürztraminer which is aged in steel barrels. 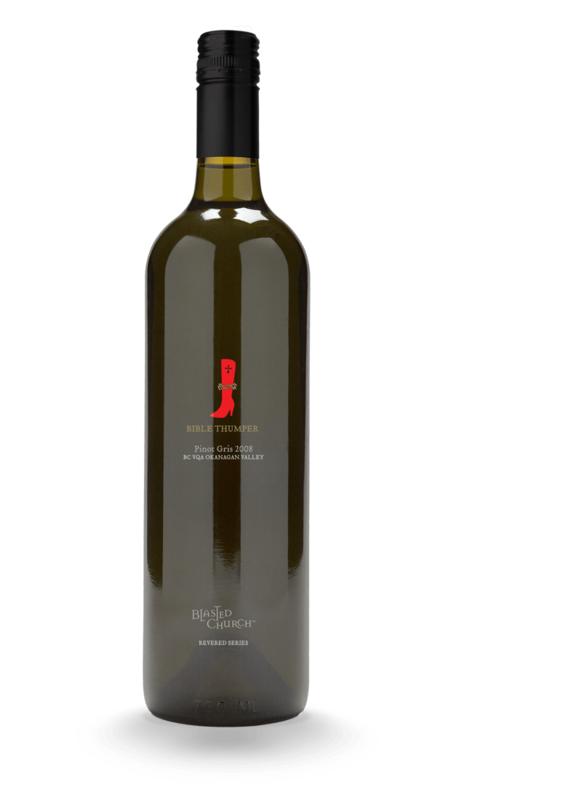 The wine remained in the oak barrels for 7 months and only 100 cases of this wine were produced. We were very happy to leave with a few bottles of this! The 2011 OMG Sparkling is prefect for a summer night on the patio with the girls. It is clean, crisp and not overly sweet (as many sparkling wines tends to be). It is super refreshing with a bright finish and I quite enjoyed the delicate berry notes in it. We picked up a bottle of this as well and will be enjoying on the patio quite soon! My husband would also like to give an honorary mention to Hatfield’s Fuse. It is a fruity, medium bodied blend and will go with a lot food. It’s one of his favourites! If I remember correctly there are notes of lychee, and other tropical fruit in there. There is a lingering finish though not as strong or in your face as the Gwertz. That’s a wrap for Blasted Church folks. The whites are excellent, the winery is adorable, the winery dog even more so. The reds may need a bit of work, but hey, we’re all works in progress and it’s only my opinion. Go try it for yourselves and let me know how you feel about the wine there. You can follow Blasted Church on Twitter at @blastedchurch.